Michael Stine’s fourth and fifth graders at Lincoln Elementary in Olympia, Washington are learning about sustainability and connecting with other students around the world. Mr. Stine’s classroom has embarked on a four-way partnership with classrooms in Carlisle, England, Kwekwe, Zimbabwe, and Cape Town, South Africa to share ideas, ask questions, and compare cultures around the issue of sustainability. Mr. Stine and the lead teacher at the English primary school met as Fulbright Classroom Exchange Teachers who swapped classrooms during the 2011-2012 school year. Their classroom-to-classroom relationship after the exchange has grown this year to include the two African schools. Mr. Stine’s students sent packages containing class sets of Trash Talk! to each of the other three schools, and the English and African students enjoyed learning about American attitudes and systems around recycling, as well as playing the games and activities that are part of Trash Talk! The schools have completed some projects and have more planned. Students from each school also made posters like the one pictured above that demonstrate how their school recycles, and mailed them to each other. Future conversations include how design of products (Cape Town is the 2014 World Design Capital) and cities can promote sustainability. Sustainability is a worldwide effort, and establishing relationships and understandings between different countries has a huge part to play! Thanks, Lincoln Elementary, for giving us this great example of how it’s done. 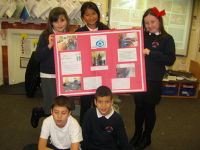 Students pictured are from Brook Street School in Carlisle, England.